Joan Mwende is the founder of Lulu Thamani Organization. She is passionate about promoting gender equality through empowering women to be better and understand their true value. She is religious and believes that religion is a common ground for a lot of people she works with; hence uses the local church to reach women and do her work. 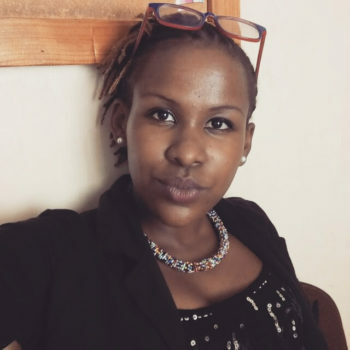 She has a Bachelors of Commerce (Marketing) from the University of Nairobi and she has practiced marketing at GlaxoSmithKline and PZ Cussons where she is working currently. In addition, she has experience in project management, financial management and resource mobilization. She is also a 2015 Akili Dada fellow. In the long run she hopes to build a facility where underprivileged women would be provided a safe space of learning skills and access resources to better their lives. She also is planning to run a retreat and conference centre in the same area to ensure sustainability of her project and also to create jobs. This is mainly by creatively and innovatively developing her organization to be a pioneer in its industry. She aspires that Lulu Thamani emerges as a social enterprise firm motivated to change the way small businesses operate within their domestic markets.